Do you want to learn how GRC is being implemented to provide strategic advantage in a successful company? Are you curious about the steps that have been take to plan and implement a strategic approach to risk management? Would you like to hear about the details of a business case for undertaking a significant GRC integration and technology implementation? Then join us for a presentation by Constellation Energy – the winner of a 2011 GRC Achievement Award and the Peer Choice Prize for most interesting project, which was awarded by OCEG at Compliance Week 2010. 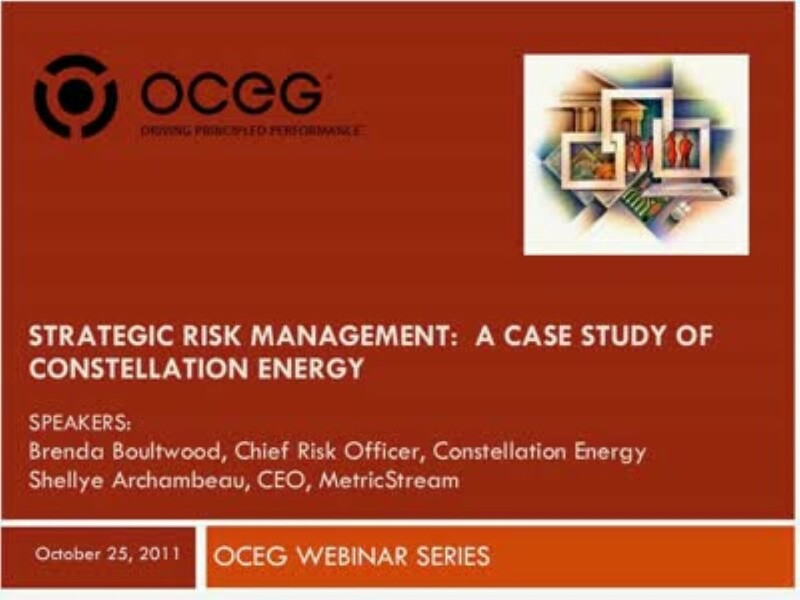 We have emailed instructions to access Strategic Risk Management: A Case Study of Constellation Energy to . Make sure the email arrives in your inbox: either add "support@oceg.org" as a safe sender to your email platform, or if you use Gmail, drag our email into your Primary tab.